MONDAY, May 21, 2018 (HealthDay News) -- Adding more grapes and berries to your diet is a tasty way to give your lung health a boost, new research suggests. Folks who ate the most foods with a particular type of flavonoid, called anthocyanins, maintained the best lung function as they aged, researchers said. Anthocyanins are found in dark-pigmented fruits and vegetables such as red grapes, blueberries and purple potatoes. "A diet rich in fruits and vegetables can help protect the lungs against damage, preserving their functionality and reducing the risk of developing respiratory diseases later in life," said the study's lead author, Vanessa Garcia-Larsen. She explained that by the time people are 30 years old, they've generally reached their peak lung capacity. "After this time, lung function started to slowly decline for everyone. The speed of decline will vary from one person to another, depending on several factors, such as smoking, physical activity, exposure to certain pollutants and the presence of other medical conditions," Garcia-Larsen explained. She's an assistant professor of human nutrition at Johns Hopkins Bloomberg School of Public Health in Baltimore. Processed foods, such as cured meats, have been shown in previous studies to be linked with a steeper decline in lung function, according to Garcia-Larsen. But the new study found that those who ate a large amount of dark-colored fruits and vegetables had a slower per year decline in lung function compared to those who ate fewer of these anthocyanin-filled foods. "This slower decline was evident even after taking into account other important factors, such as smoking and age," she said. However, the study was only designed to find an association; it cannot prove cause and effect. Samantha Heller, a registered dietician at NYU Langone Health System in New York City, said the findings make sense. 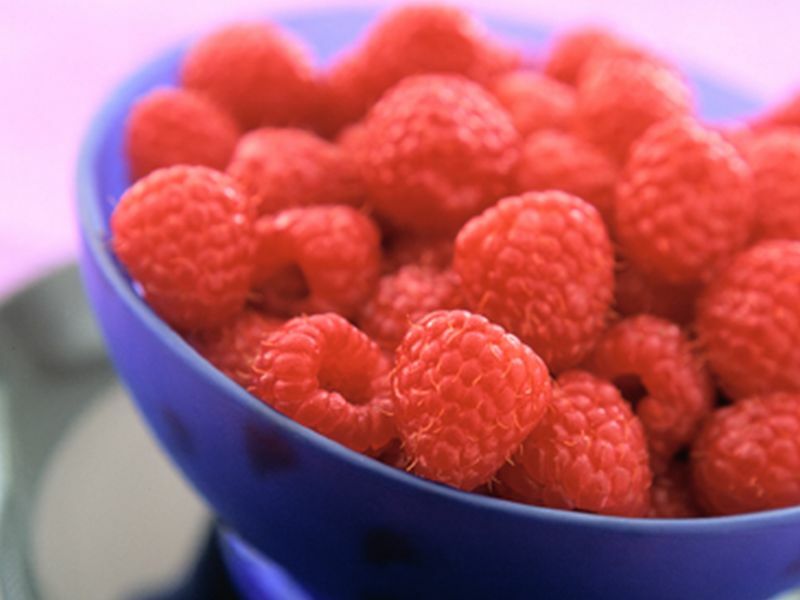 "Anthocyanins have been shown to have really positive health effects. They're full of antioxidants, and if you eat a whole piece of fruit, you're getting a whole lot of other healthy compounds, too," she said. "Plus, there's less room on the plate for the less healthy foods. And, it's not just one type of food that's key for good health," Heller noted. "Everything that's plant-based works together to help fight disease and protect against cell damage." The study included 463 adults from Norway and England. Their average age was 44. The participants all completed dietary questionnaires and a lung function test at the start of the study. Ten years later, their lung function was tested again. The researchers saw a relationship between anthocyanin consumption and lung health -- the more people ate, the better their lung health. According to Garcia-Larsen, "Foods rich in anthocyanin flavonoids might protect the lungs through their antioxidant and anti-inflammatory properties, which have been extensively demonstrated in experimental studies." She added that a few hours after eating foods such as berries, there's evidence of the flavonoids in lung tissue. This "suggests that [anthocyanin-foods] might have a functional role protecting the lungs against the pollutants and other environmental insults," such as smoking, Garcia-Larsen noted. These dark-pigmented fruits and vegetables seemed to be most helpful for people who never smoked and those who had quit smoking. Smokers should stop, Garcia-Larsen said, because it's the best thing they can do for their lungs. The toxins in smoke may impair the ability of antioxidants or anti-inflammatory effects to counteract smoking damage. But when smokers quit, she said, they did get a benefit from anthocyanin in fruits and veggies. Garcia-Larsen is scheduled to present the findings Monday at an American Thoracic Society meeting in San Diego. Findings presented at meetings are typically viewed as preliminary until they've been published in a peer-reviewed journal.